Thinking that our readers would be interested in some information on hydrojet systems, we chose one of the companies that, over the years, has made a world-class name for itself in the development of this means of propulsion. Hamilton, a company based in New Zealand, was founded back in 1939 by Sir William Hamilton. At first, the company was involved in work very different from what it later became famous for but the study of mechanical solutions which could result in high performance has always been the focus of the founder's personal and entrepreneurial endeavours. 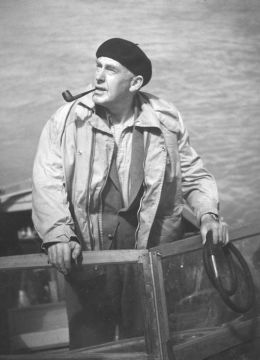 Sir Hamilton began to work on the idea of a hydrojet in 1951 after having created a propulsion system for river navigation which proved not to be very successful. This experience, however, led him to develop a different system which, in 1954, became the first Hamilton jet, later further developed with the help of an engineer who had been involved in the research, George Davison. Together, they soon came up with a hydrojet and, in 1959, it was used to travel down the Colorado River at extraordinary speeds. Earlier, in 1956, the company had produced the first true hydrojet system, one which performed well on light boats; in 1957, they produced the system known as "Chinook", which featured two axial turbines and thus performed even better. In 1963, the "Colorado" series was a turning point. Working on the design, Hamilton was able to develop a much simpler and more economical system, one which was also particularly efficient and adaptable to many different kinds of boats, including those intended for competition. Naturally, during these years there was growing interest in this new system among boating professionals. In 1970, the company from New Zealand put the "Work Jets" system on the market. This version was larger and intended to support very heavy workloads and thereby satisfied the requirements of diesel ships, large launches and other types of craft put to demanding use. This series was the beginning of what the company then called the HM Series, still in production today with systems that have been updated over the years and which are used on numerous super-yachts and vessels destined for passenger transport and coastal surveillance. Returning to the story of Hamilton's hydrojet, in 1973 the company produced a standardised system for the installation of its jets on hulls which freed up interior space and was managed with simpler, modern control systems. In 1975, the company introduced the first system specifically designed for commercial use, the 1031 Model, which was soon in wide use around the world. After the presentation in 1980 of the 400 Series for boats over 30 metres in length, this model became the basis of all of Hamilton Waterjets' production as of 1984. It was in that year that the company launched its systems using a deflector technology, applied for the first time to the 1031 series. In 1990, the HM Series was also used for boats over 60 metres in length, where it proved to be a highly performing system. In 1991, the HS Series was launched, intended for particularly fast boats with a maximum power of around 1200 HP. 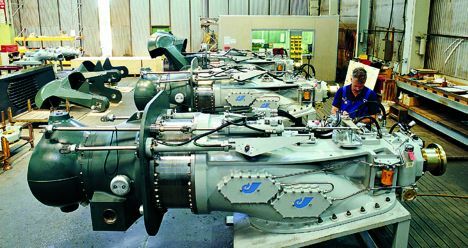 Between 1993 and 1998, Hamilton developed various and increasingly evolved hydro-jet systems able to guarantee increasingly effective thrust. It was also during the 1990s that electronic systems were developed for increasingly simpler management of the hydro-jets. In 2003, Hamilton presented the HJ403 and HJ391 Models, both developed for ease of installation and maintenance yet with maximum efficiency and simple and intuitive control systems. Now, after having told the story of Hamilton Jets, albeit briefly, we would like to describe, in just a few words, how a hydro-jet works, or at least the fundamental principle on which it is based. The propulsive action is the result of the reaction created by energy generated by water pressure exerted in the direction opposite to the travel direction. Water is first drawn in and then pumped and expelled from the system under increased pressure arrived at by the action of the jet. The number of pump revolutions is variable (depending, obviously, on the motor's rpm), which in turn varies the water pressure. Turning action is obtained by means of a system, which orients the direction of the jet so that the thrust moves the stern in the opposite direction. All of this is possible thanks to a system which directs the high-pressure water-flow from the pump and which is controllable from the bridge. The thrust can also be directed towards the prow or downwards with resulting movement in reverse and stabilisation. This means that the boat can be oriented accurately and effectively, even at low speeds. Even in this brief description, some space, however limited, must be given to listing some of the advantages derived from the use of this type of transmission. One of the major advantages is the high level of manoeuvrability at any speed, thanks to the very system we have described, which ensures an efficiency of lateral thrust, which is otherwise not obtainable. Other advantages are: propulsive efficiency and therefore high performance and maximum yield; limited draught, since the jets are installed on the transom; maintenance reduced to the minimum; silence, thanks to the absence of underwater rotating elements; ease of installation, given that the system is supplied complete and ready to assemble. In addition, alignment with the motors is problem-free and immediate. Control of changes of course at all speeds is easy and efficient without any evolutive effect. This is managed by Hamilton's JT system thanks to which control of the jets is intuitive and can be done by practically anyone. We recently tried out this type of transmission (which have previously discussed in Superyacht). Suffice it to say that we were very positively impressed. We personally verified that everything considered to be a plus with this transmission system is in fact just that.